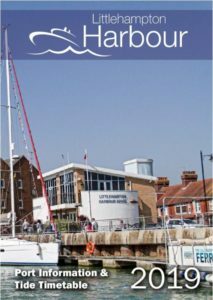 Our Port Information & Tide Timetable booklet is produced annually and shared with all harbour users and visitors for free. You can collect yours from the harbour office and other venues across Littlehampton. Please contact us if you would like copies to share with your customers. Unfortunately, due to copyright reasons, annual tide tables cannot be made publicly available online but you can Click Here to download a copy of the 2019 booklet with tide tables removed. Full tide tables are © Crown Copyright and/or Crown Database rights reproduced in print by permission of the Controller of Her Majesty’s Stationery Office and the UK Hydrographic Office (UKHO). Under the terms and conditions of the Littlehampton Harbour’s bilateral agreement with the UKHO, the full annual tide tables for the Port of Littlehampton can be distributed to harbour users and visitors in print but not made publicly available online. Contact the Harbour Office for printed copies. If third parties want to reproduce or make copies of the printed tide tables, they will require a UKHO copyright licence (contact 01823 337900 or visit www.ukho.gov.uk).